In 2013 Peter Scudamore left the Cheltenham sales with One For Arthur. He also thought that he had paid too much for him. Little did he know that just four years later he would see him romp home to win the Grand National. Trained by Lucinda Russell, One For Arthur became the first Scottish-trained winner in nearly 40 years. Ridden by Derek Fox he finished a solid four and a half lengths ahead of his nearest rival, Cause Of Causes. Unfortunately, that was also the last time we saw him out running as he has since been side-lined through injury. The good news is that he is now back in training and expected to make his seasonal debut very shortly. That isn't due to happen until the end of November so we have a few weeks to wait yet. In the mean time you can keep an eye out for potential rivals as the hunt season gets well under way with some good weekend horse racing tips available. Peter Scudamore and his son Tom have just published ‘Three Of A Kind', a book that explores his family history. From father Michael Scudamore riding Oxo to victory in the 1959 National, through his own career of eight jockey’s titles to current rider Tom’s experiences. A family steeped in racing, it was the death of his father and mother Mary within days of each other back in 2014 which provided inspiration to put their lives on paper. “The chances of both getting there are maybe slim, but it’ll be great if we can. It will be some contest. 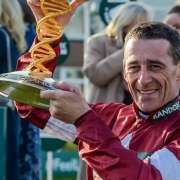 Already bookmakers are hedging their bets, with Tiger Roll on 20/1 ante-post and One For Arthur priced at 25/1 ante-post to win the 2019 Grand National. Of course there are others in the mix who could potentially spoil the party but the official deadline for entries is not until January 30th 2019 so we have to wait a bit longer to see who gets the green light. It has also been announced that for the first time in the race's history that the Grand National Weights Lunch will be held in Liverpool. Due to take place in the Cunard Building on February 12th, it marks the 100th anniversary of the race being held in the iconic city.